Love the Jewlry from FromtheSoul. Beautiful and well made! Amazing quality and unique! I placed my first order from “From the Soul Jewelry” in October. I ordered 5 items. Every piece arrived as promised: on time, beautifully gift-boxed, and all the bracelets were designed and made well. My instructions regarding making 2 bracelets larger due to my carpel tunnel surgery were meticulously followed. Both bracelets fit perfectly. It is apparent that the owners craft with pride and integrity. Nancy Ortiz and Olivia O'Toole, From the Soul owners and designers. Olivia helping her brother create his own design. A few years ago, after being home with my beautiful family for 16 years, I began designing jewelry. I fell in love with it all—the beauty of the gemstones, the metaphysical properties of the pieces, and the creative energy of the design process. Most of all my soul connected with the unique beauty of each piece. In 2013, my 17-year-old daughter, Olivia, joined me in what is now our shared endeavor, From the Soul Jewelry. Together we continue to create jewelry that "Celebrates the Beauty Within". 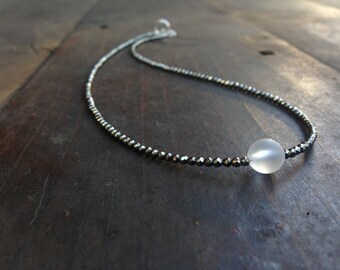 From the Soul handmade jewelry intends to inspire with a beauty that celebrates the greatness within each Soul. Each piece uniquely blends ancient spiritual symbols with semi-precious gemstones and metals from around the globe. Our hope is that you find something that connects with your Soul. 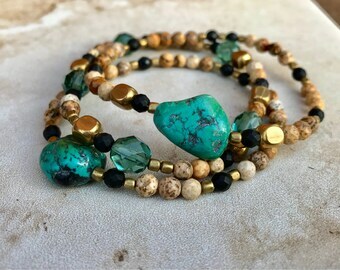 So grateful that your Soul connects with our handmade jewelry. If you don't find something here feel free to contact us for something custom. We are now selling our jewelry at Mountain Daisy Boutique, Fringe, and Cuts n Stuff Salon in Evergreen, Colorado; also in Denver at Core Power - Stapleton and Vouna in Arvada, Colorado. Our goal is that the piece you choose connects with your Soul. We guarantee the quality and craftsmanship of our pieces and want you to be completely satisfied. However, If you do not connect with any piece, return the item in the original packaging unaltered within 7 days of receipt for a refund or exchange. Shipping fees are non-refundable. We strongly recommend that you purchase delivery confirmation for your return. We cannot be held responsible for the loss of returns. Please contact us prior to returning any item. A refund will be issued through PayPal upon receipt of returned item. From the Soul accepts payment through PayPal. Buyers do not need a Paypal account to pay if you are using a credit card. Paypal is simply a means for processing credit card payments. All information is kept confidential with Paypal. Your order will be packaged with the utmost care and shipped within 1-3 business days after receipt of payment. We pride ourselves on prompt shipping and want you to have your purchase as soon as possible. Watch for a tracking number confirmation. Always feel free to contact us if there is any delay. U.S SHIPPING: All purchases will be shipped USPS First Class with delivery confirmation. Please contact us to add the cost of insurance to your item. INTERNATIONAL SHIPPING: Your package will be shipped using First Class International Shipping. Please note that once your package is shipped, there will be no way to track it. Buyers are responsible for all fees associated with shipping to their respective countries.